Toby arrived with Coco as although they were loved very much his previous owners did not have the time for the two horses. Toby has had a difficult start and when he arrived he was very nervous. He could not wear a rug as he was scared of things being put on his back, he did not tie up outside the stable and did not box. He needed an experienced rider as he could be quite spooky and was very cold backed. Toby has made a lot of progress while at Summerfield Stables. He is good to ride and hack out. 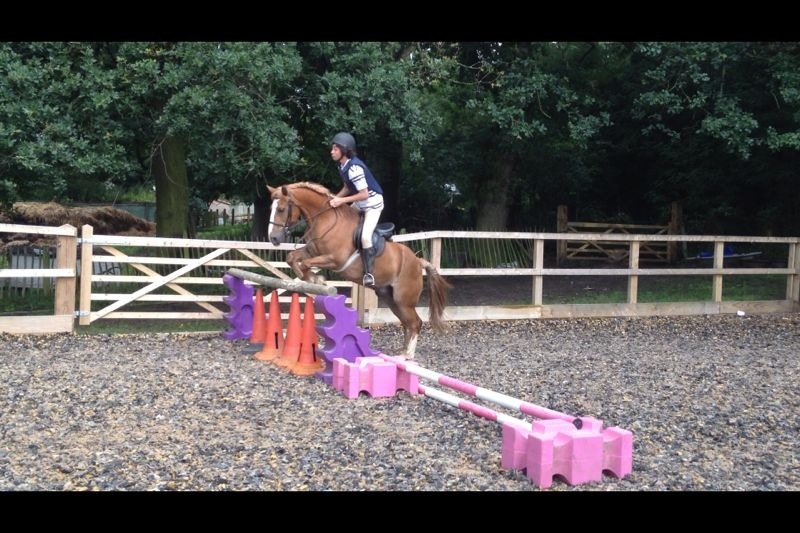 He loves jumping and is forward going but a good second horse. He still needs an experienced rider to handle and to ride him but he has come a long way and we are very pleased with his progress. Toby is more confident in a show atmosphere on the home field. His canter is more balanced and he has increased confidence over fillers. He is now more happy with being ridden by different riders rather than just one person. Toby is retired due to arthritis in his hocks. He is currently living as a companion with a friends horse and is enjoying life with his new girlfriend. Recently he had dentistry work to remove a loose tooth (which took over 4hrs!) and now is eating comfortably again!